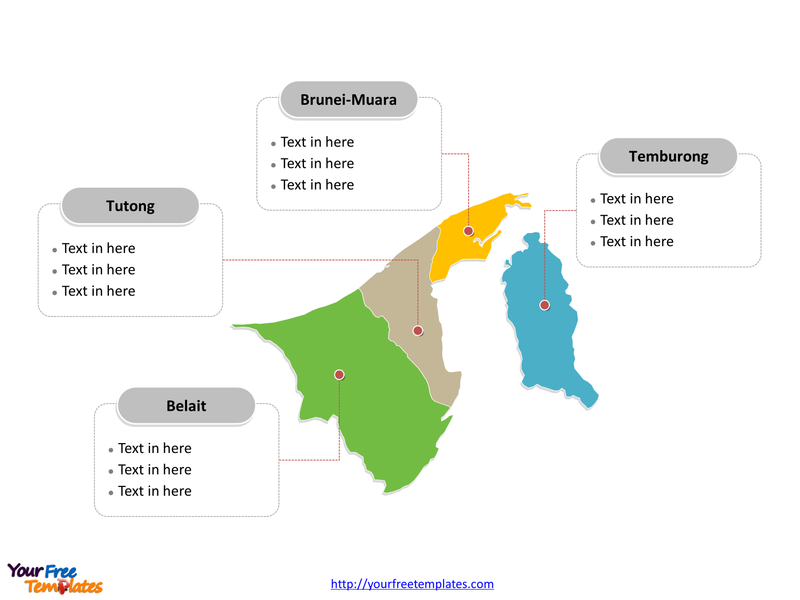 The Brunei Editable Map Template in PowerPoint format includes two slides, that is, the Brunei map with outline and Brunei political map. 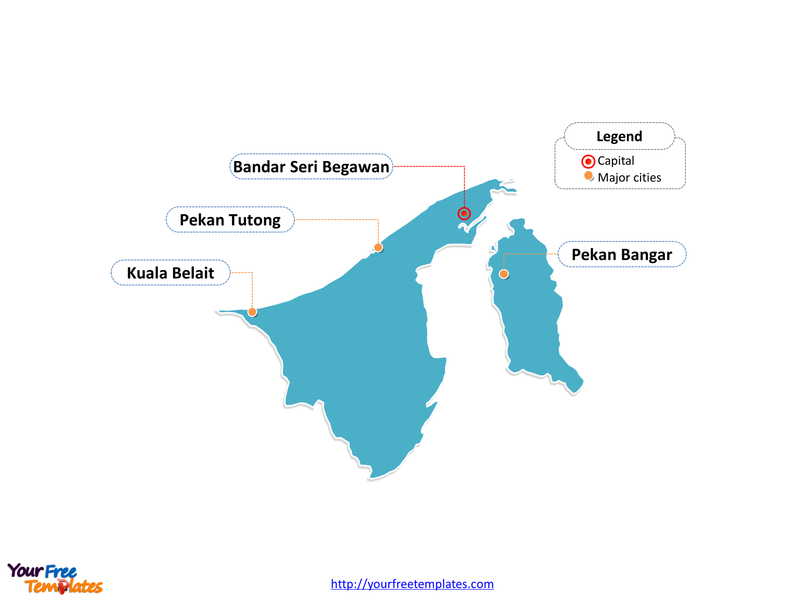 Firstly, our Brunei outline map template has capital and cities on it. Secondly, there are four districts in our Brunei political map, labeling the four divisions. The Map of Brunei Template includes two slides. Slide 1, Brunei map of outline labeled with capital and major cities. Our Brunei map is for the state located on the north coast of the island of Borneo in Southeast Asia. the country is completely surrounded by the state of Sarawak, Malaysia. It is separated into two parts by the Sarawak district of Limbang. Brunei is the only sovereign state completely on the island of Borneo; the remainder of the island’s territory is divided between the nations of Malaysia and Indonesia. Furthermore Bandar Seri Begawan is the capital and largest city of Brunei. Since our Brunei map slide has the capital and important cities on the outline. Consequently users can remove cities or include new ones to create their unique Brunei maps and apply in different docks. Slide 2,Brunei Editable map labeled with regions. The Brunei map is the country political division of four districts. They are Belait, Brunei-Muara, Temburong, and Tutong. Furthermore every individual political district is an editable shape. As a result, you can change the texts, colors, sizes, highlight some map shapes, and add your description on target districts. At the same time you can also refer to the fully labeled Brunei map in Wikipedia Brunei. We guess you will like our maps, as analysts from marketing research companies, or consultants from professional firms have appreciated our beautiful PowerPoint templates very much; because our maps can make their docks more attractive.